On a whim I sort of told myself that it was time to start getting some practice in for Christmas Cookie Season. Because Thanksgiving is almost upon us and that means Christmas is soon to follow, was my thinking. That, and I wasn't really feeling up to the Vegan Thanksgiving Menu post you'd expect to see right around this time. So. Among the easiest of all Christmas Cookies? The regular old chocolate chip ones. But just because they're a staple doesn't mean they don't have to taste better than regular. 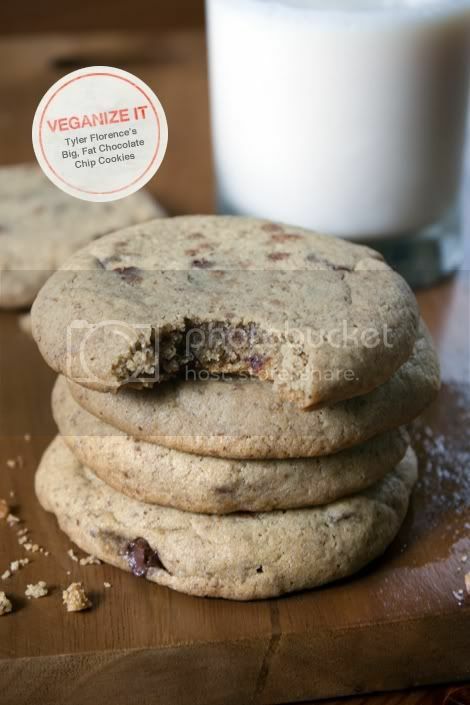 I've been trying different veganized versions of chocolate chip cookies and I hit on a great one with a vegan version of Tyler Florence's Big Fat Chocolate Chip Cookies. They're big, fat, bursting with chocolate chips, crispy on the outside and soft and chewy on the inside. I've used ground flax seeds whipped with water as the egg replacer for two eggs because I think the earthy, granola taste from the flax works well with cookies like these. You can experiment with other egg replacers if you'd like. To start: Preheat the oven to 350° F.
Line 2 cookie sheets with parchment paper. Sift together the flour, baking soda, and salt into a medium bowl and set aside. Beat together the flax seeds and water in a small bowl using a whisk or a fork until it takes on the texture of egg whites. Cream the butter and sugar: Place the Earth Balance, sugar, and brown sugar in a large bowl; cream together with a hand mixer on medium speed until light and fluffy. Scrape down the sides of the bowl with a rubber spatula. Beat in the vanilla and flax/water mixture. Gradually add the dry ingredients to the creamed mixture and continue to mix until a smooth batter forms. Turn off the mixer and fold in the chocolate chunks using the spatula. Prepare the cookies to bake: To form the cookies, scoop about 1/4 cup of cookie dough into your hands and roll it around into a ball; place them about 3-inches apart onto the prepared cookie sheets; you should get about 4 (maybe 6) cookies on each pan. Press down the tops of the dough slightly and bake until the cookies are light brown, 12 minutes for chewy cookies, or about 15 minutes for crispy cookies. Hi Alyssa. I'm definitely going to try out this recipe. I know there are many different kinds of egg replacer. Would you please tell me how do you choose what type of egg replacer to use when you need it? I should probably do a proper blog post about my take on replacing eggs. But to answer your question, I choose which type of replacer to use based on the type of baked good I'm making. Generally, for cookies and muffins I use the flax/water method. The flax seeds have an earthy, granola-like taste and I find that when I use them in cookies and muffins (corn muffins, etc), the flavor (and texture) works very well. Also pancakes and whole grain baked goods are perfect candidates for this type of replacer. For cupcakes and cakes I use soy yogurt and/or vegetable oil. I like the moisture I get with this type of replacer, and there is no added flavor to your baked goods. You can also use bananas or applesauce, but I personally stay away from these because they make things (IMO) taste "vegan-y" or "nonfat-y". For me, they also seem to add too much of a banana or apple taste to my baked goods, so I prefer to use soy yogurt or flax seeds whipped with water. And then there's Ener-G Egg Replacer. I've never actually used it! For some reason, I just prefer to use natural replacers. From what I've heard, Ener-G works well in cookies, but makes things a bit crispy. Thanks for the comment (and question)! Can I ask why you mix together the flax seeds by hand, rather than in a blender? The results in a blender are so much more cohesive and egg-like, and also end up, at least when I've run the blender for more than a couple of seconds, producing less particulate matter in the baked goods, which I usually like - it's less of the hippie health food mouthfeel. Do you just like to avoid washing the extra dish? I understand what you're saying but I've made these cookies a few times using pre-ground flax seeds (as opposed to ones I've ground myself) and there truly is not a "hippie health food" mouthfeel. Each time I've made them they've turned out crispy on the outside and moist on the inside. Using Earth Balance and brown sugar, and the flavors of the vanilla extract and chocolate chips really cuts any granola flavor the flax may impart. I'm not sure what you mean when you say you mix the flax and water in a blender. I always whip the mixture as you would egg whites, and I do that in a bowl using a fork or wire whisk. You can also do this with a hand mixer but it's not necessary. When you say "in a blender" are you referring to grinding your own flax seeds? This would, indeed, be the preferred method and I would do that in a spice grinder prior to mixing them with water in a small bowl and whipping with a fork or wire whisk. I've used pre-ground flax seeds mainly because that's what I happen to have in my pantry currently. Maybe you would be able to elaborate some more on your method. I'd love to hear how you do it! Sure. This is from the vegan dark ages, I think actually before ener-g was available anywhere except from pangea, which was still a mailorder catalog? I think it was how I was taught to make vegan eggs in food not bombs, and the thing is - it makes gorgeous eggs that actually look like eggwhite. It's not that you grind whole flax seeds in a blender. I keep pre-ground flax in the freezer. But I measure out an "egg" and warm water and that goes in the blender, and then after a minute or so, it's made an emulsion and also expanded in size significantly beyond what it does when you whip it. The particles get softened too... maybe I'm just traumatized by so many flax-y vegan baked goods over the years, but I'm always nervous about baking flax especially into something that isn't, like, buckwheat-flavored already. I'm baking your pumpkin loaf again tonight, but I'll try these out soon, maybe both with and without the blender method to see if there's any difference at all. Ooo, the pumpkin loaf is one of my favorites. How do you like it? Made these cookies today. First time using the ground flax seed and it worked really well. They are super tasty! Thanks for the veganized recipe Alyssa. Awesome! If you want to avoid the brown flecks the ground flax seeds leave in the cookies (I don't mind them but people usually ask what they are), you can buy golden flax meal. Bob's Red Mill makes some and it's pretty easy to find in any supermarket.